Skincare is a big deal for me! I love trying different products and seeing how they feel on my skin because let's face it we all love a freshly pampered good skin day. I know skincare is difficult at times because you just never know if it'll work for you, sometimes we just have to try and hope for the best! I feel this way a lot as my skin is oily and not everything works for me, I can't use anything too hydrating or thick, so I have to be careful when shopping around for new products! 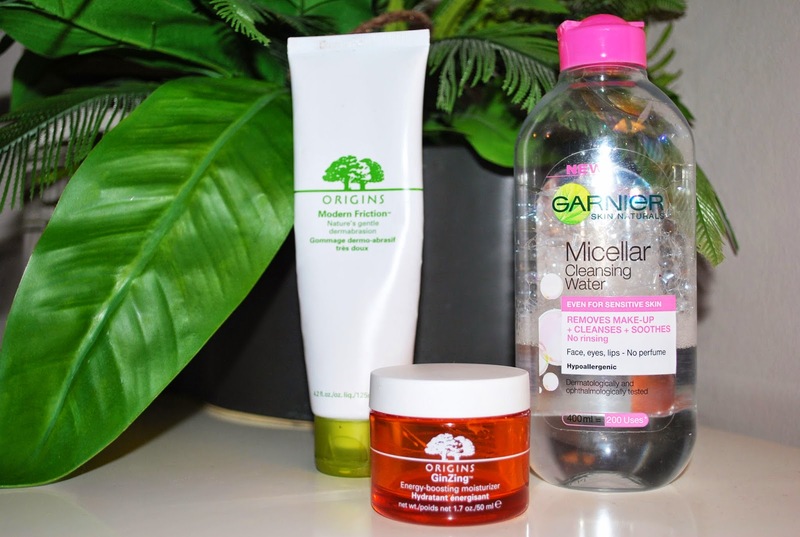 Firstly, Garnier Micellar Cleansing Water - Let's start from the basics, taking our makeup off! (the not so fun part about makeup) Sometimes it feels it's such a chore, using an eye makeup remover, then a cleanser, then back in to remove any excess product, then you think just pass me a face wipe! I don't like using face wipes everyday and only use them as a last resort, but they always seem so handy as they remove everything! That was until I came across this product, I have used cleansing waters in the past but found they didn't remove everything and you end going through half a pack of cotton wool by the time you have finished. But this just seems to melt everything away without having to use a lot of product! AND can i just say, it can be used for face, eyes and lips..(I know, it sounds to good to be true) It has been a life saver over the past few months for me, its super quick and really affordable for a 400ml bottle so it lasts a while even when using it everyday. Origins Modern Friction - Also known as Nature's gentle dermabrasion. I use this product to exfoliate my skin 1-2 times a week to remove any dead skin and to leave my skin feeling new again! my favourite thing about this product is it isn't rough, it does exactly as it says and feels gentle as you scrub your skin, as some exfoliaters are very harsh and can even sometimes hurt the skin and feel uncomfortable. This is lovely and makes my skin feeling the best it has ever felt, smooth, soft and squeaky clean without any redness or discomfort, this is the second bottle I have purchased, meaning top marks from me! Origins GinZing Moisturiser - Honestly I have been really impressed with Origins this year, this is the first product I purchased from them and since then I have tried all sorts of goodies! I can be very fussy about moisturiser as I don't like a thick substance and prefer it to sink into my skin evenly leaving the skin feeling refreshed, so until I came across the GinZing I was struggling to find a product I was really happy with. I use this day and night, it is in a gel like form and also smells of oranges, which is always a plus! It feels non-greasy on the skin and feels almost cooling when you apply, making you feel awake and refreshed as it soaks into the skin. This is definitley a must have for me, it has been the best moisturiser I have used so far! It is always a good feeling when you are well and truly satisfied when you have finished a product and want to repurchase it again (not so good for your purse!) I just thought these needed to have a moment in the limelight I was that impressed!